Recommended titles grouped by theme/topic ... with a list of English Civil War novels at the bottom. Cromwell - Arthur Bates (1970) Tie-in with the film. * "Saraband For Two Sisters" by Philippa Carr (1976) - This was one of my favourites in high school. * "The Wandering Prince" by Jean Plaidy (1956) - This one is about Charles II's early life, including the Civil War and his years in exile. * "A Health Unto His Majesty" by Jean Plaidy (1956) - Restoration England. * "Here Lies Our Sovereign Lord" by Jean Plaidy (1957) - Continues Charles II's story. They can be also bought in a single volume. Thanks Carolyn - I hadn't heard of any of these. I'll review and add to the list - cheers! You may also be interested in my new book, "The King's Henchman. Henry Jermyn, Stuart Spymaster and Architect of the British Empire (Gibson Square, 2012) which is about the career of Henry Jermyn (1605-1684), Queen Henrietta Maria's life-long servant and possibly lover. It is about all their lives, but includes a lot about their part in the Civil War - trying to avert it, and then trying to win it. Henry Jermyn has never been studied before so my book casts a new light on this period. The story was fictionalised by Fiona Mountain in Cavalier Queen, a novel you have on your list above. I would have e-mailed you about this privately at first, but cannot find any means of doing so - hence this rather public message! Hi - I'm not particularly familiar with Jermyn, but he certainly sounds like an interesting character. Do you know whether he ever visited HM at Titchfield (Hants.)? PS - contact details are on the About page. Hello - You may like to know about Keith J Wilson's new novel due to be published on December 1st 2013. Best to go to his website www.keithjwilson.co.uk for full details of 'Letters from the Past'. I'll try and paste his synopsis below, but it's quite long so may not fit. Should be a great novel - well worth checking out. No, the synopsis is far too long for here. Briefly, though, it is set in Northamptonshire as the Civil War starts with Ralph Somers - a supporter of the King - enlisting with the Roundhead Army as a spy. It follows the course of the war with clandestine meetings, skirmishes, the major battles, secret letters plus - from the sound of it much, much more. Read Keith's own synopsis on his website. Pre-order now for a preferential price. Should be a page turner. 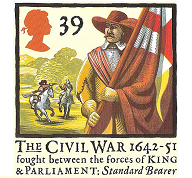 I don't know if you have Tristram Hunt's 'The English Civil War: At First Hand' published by Windenfeld and Nicolson which has a great collection of primary sources in between the narrative overview of the war. It could be worth adding to your list. Thanks - I'm aware of it but haven't laid hands on a copy. Will try to get hold of one! Hi Alison - thought I had these in there - can you give me the publication dates for each? Thanks. Alison - these are on the list now. Thanks. There's always my Uncivil Wars series...probably the best series ever written about this period, according to one reader. Have added these - thanks. Hi there, I have a debut novel that mainly takes place from 1650 -1651. The title is Traitor's Knot and it's a historical romance. It was just released May 2017. Thanks Cryssa - will add to the list.